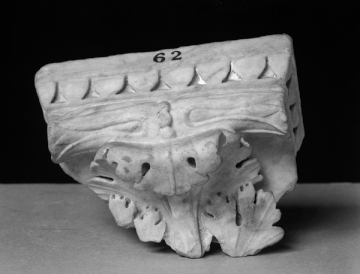 This console is enriched (top to bottom) with water leaf, beneath a plain surface, a ridged, perhaps beaded, fillet, an enriched baluster-end and acanthus-leaf scroll. As previous Vermeule 114 (Rome; collected by Charles Heathcote Tatham for the architect Henry Holland during the 1790s. See Cornelius Vermeule, unpublished catalogue of the Antiquities at Sir John Soane's Museum, Introduction, transcription of Tatham letters, List 1, no. 47).